Australia and the South Pacific's pioneer of small-ship expedition cruising Coral Princess Cruises has launched their 2012/13 summer cruising schedule in New Zealand. 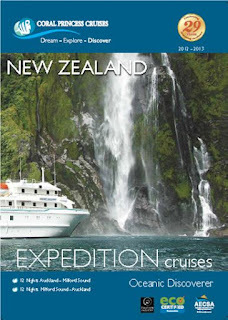 The company's new brochure features a series of 12-night expeditions between Auckland and Milford Sound (and v.v.) aboard their state-of-the-art 72 passenger small ship Oceanic Discoverer. To celebrate the launch of the cruises, which operate between December and February annually, Coral Princess is offering earlybird savings of up to 25% on their annual Christmas Cruise, departing Auckland on 18 December 2012. The expedition, which explores the east coast of both the north and south islands, takes expeditioners to some of the most scenic– and most difficult to access – locations that the 'land of the long white cloud' has to offer. From Auckland, the cruise takes in White Island's active volcano, art deco Napier, Gisborne's Maori culture and the scenic Marlborough Sounds. On the South Island, a whalewatching cruise is included in Kaikoura, the opportunity to swim with dolphins in Akaroa and time to explore historic Dunedin. A locally guided wildlife tour on Stewart Island and three days exploring the stunning waterways of Fiordland National Park complete the expedition. Cruising by luxury small ship allows access to areas beyond the reach of bigger ships; in Fiordland not only will guests discover Milford Sound, they will also explore Doutbful, Dusky, Breaksea and Thompson sounds. The discounted prices for the 12-night New Zealand 'Aotearoa' cruise aboard Oceanic Discoverer start at $6,180 per person for Coral Princess Cruises past guests (25% off) and $7,004 for first time travellers (15% off) in a Main Deck (Category B) Stateroom. The reduced prices include all meals, lectures and services of the all-Australian and New Zealand expedition staff and excursions aboard a fleet of zodiacs and the unique 'Xplorer' excursion tender. The discount is available on the cruise departing Auckland on 18 December 2012, and is available until 31 May 2012 or until sold out. Australian-owned Coral Princess Cruises pioneered small-ship expedition cruising in Australia in 1983 and operates a fleet of three small ships on Australia's Great Barrier Reef, Kimberley Coast and Cape York & Arnhem Land. Further afield, there are expeditions to Papua New Guinea, Melanesia and New Zealand. The company is also currently offering savings of up to 25% on its 10 night Kimberley Expeditions between Darwin and Broome during the April 2012 "Waterfall Season".